Welcome to Trade Point Finland, a part Casumo on verrattain uusi kasino of the United Nations Global Trade Point Network. 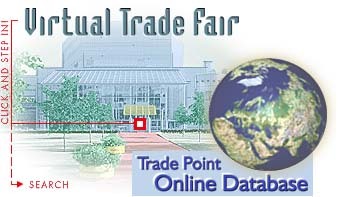 Visit our Finnish Virtual Trade Fair and you'll find Finnish companies as well as their products by business field. With Trade Point Online Database you can feed and update your own business data and offers or link www-homepages from your own desk. Our services are increasing all the time so keep coming to our site. Search for company information, sales offers and purchase offers from all over the world. The information is gathered from the Global Trade Point Network and then put to a handy matrix structure. Find presentations of Finnish companies and their products. The companies are classified by business field. Business news links and other valuable information from today. Imporant information on Finland, European Union, Banking, Insurance, Customs, Transportation etc. Some of the best links of the network's services. Find out more about us and our services in Finland and abroad. Netscape 1.1/MS Explorer/Mosaic 2.0 or newer versions. Copyright © 1995, Trade Point Finland Ltd. All rights reserved. Technology provided by Electronic Trade Center ETC Ltd.